Anodized Aluminium, Flat Riveted, Half Sleeve Chain Mail Haubergeon , Size S - this item is being discontinued. Anodized Aluminium, Flat Riveted, Half Sleeve Chain Mail Haubergeon , Size M - this item is being discontinued. Anodized Aluminium, Flat Riveted, Half Sleeve Chain Mail Haubergeon , Size L - this item is being discontinued. Anodized Aluminium, Flat Riveted, Half Sleeve Chain Mail Haubergeon , Size XL - this item is being discontinued. Anodized Aluminium, Flat Riveted, Half Sleeve Chain Mail Haubergeon , Size XXL - this item is being discontinued. 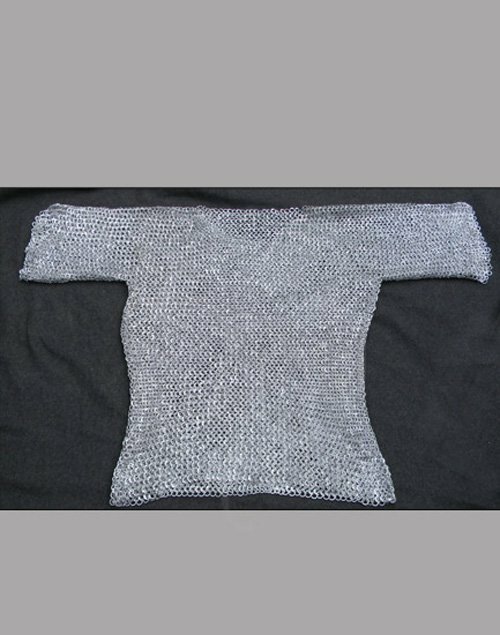 This Chainmail Haubergeon is a shirt of mid thigh length with elbow length sleeves. 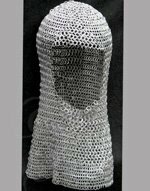 Each of these incredible chainmaille shirts is painstakingly and skillfully created by hand, to form a continuous blanket of metal ring protection. 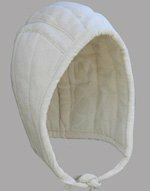 Our craftsmen use the most authentic medieval 4 in 1 pattern of maille. 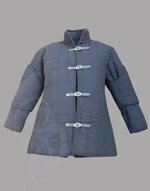 *For a good fit, make sure you wear all clothing / padding before taking measurements. 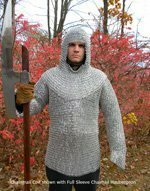 Anybody opting for a medium size shirt should have maximum chest size 42 inches with any garments on to be worn under the chainmail.